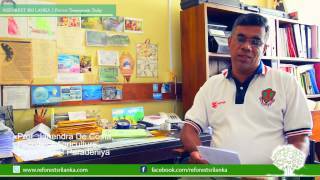 Prof. Costa explains why Sri Lanka became the bio diversity hotspot it is today and talks about the importance of Sinharaja and Kanneliya forests. Forests play a major role of some the earth's majour geochemical cycles, namely the carbon and water cycles. Also they help earth retain water with the trees providing a sponge effect on rainfall. 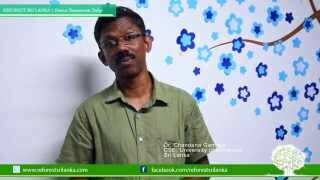 Listen to Prof. Costa's 5 minute lecture to understand more. 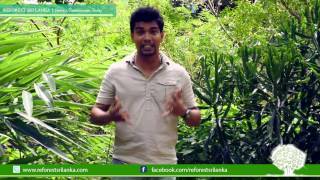 Sri Lanka is losing its forests fast. Every year more than 3500 hectares or an area the size of 2470 cricket grounds are cleared for timber, agricultural land, colonization and illegal exploitation. We need to act today to save our island paradise and sustain it's natural wonders. We are known internationally for our eco-systems, plant and wild life and they are a part of our common heritage. Do your part and plant a tree today.